Happy Xmas, Ymas to all the Zumans along the Human Highway. 2017 was a rough year for this planet. We could expand on this ad nauseam. Instead, here’s an excerpt from a Christmas story by Scott Young about his son, Neil Young, found in the book: “Home for Christmas, and other stories” on the blog, “The Dusty Bookcase” by Brian Busby. Almost everyone has his own favorite Christmas story. I believe that I am particularly lucky in that my favorite concerns one of my sons. He is 19 now, a little taller than I am and a lot thinner. But this story happened six yard ago when he was 13 and delivered a Globe and Mail route on Brookdale Avenue in North Toronto. I used to hear him almost every morning at six when he wakened. Usually the two hours after he left were my soundest sleep of the night. On the rare occasions when he overslept, this built-in alarm mechanism in my mind brought me awake about the time he should have been moving. When I could not hear him I would tiptoe to his room and say, “Neil”. “Yes,” he’d say instantly, sitting upright in bed, wide awake. But on this Christmas morning of 1958 he was up on time and, like all other Globe and Mail boys up that morning, rose when the world was black and cold. He made the blind trip to the bathroom and sleepily began to pull on his clothes. Downstairs, he stood for a moment and looked at the stacked and laden Christmas tree, did the slow march past it, stopped to shake a parcel or two and stood like a robin to listen, and then went on. A glass of milk and a brief forage in the refrigerator, and then on with his ear-covering cap and his scarf and parka and overshoes and mitts, on that ice-cold bicycle seat and down the driveway to pedal into the morning alone. Enjoy life with those who can feel your love. Happy season of the spirit of peace and goodwill on earth. To Zumans and Rusties and all who enjoy Neil Young’s music and his activism, as he tries to leave a lasting imprint on Mother Earth. Let’s keep on rockin’ in the free world, and help others to do so as well. We wish you all a great fest and thanks for being here. Also many thanks to the BNB team that makes all this possible. 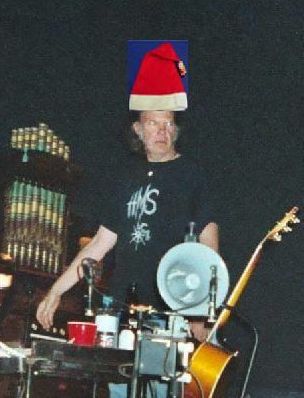 It’s been a Neil Young year of change — many awards, a European tour finished up with Rick Rosas,(unfortunately Rick’s sudden passing this year), two new albums “A Letter Home” and “Storytone,” a solo acoustic tour, a new book “Special Deluxe,” Neil’s activism, and numerous guest appearances, a new girlfriend and pending divorce from his wife of 36 years….so many Zumans and Neil fans meeting around the world. Personally there has been the loss of The Baron, our leader on BNB and HH, and the resurrection of all he created by his dear friend Albert, the Lighthouse, with a little help from friends. Have a peaceful outcome of this year and a colorful outlook for next year, 2015.
and there will always be comets in the sky…. It’s been a great Neil Young year — The Alchemy Tour through Australia and Europe (unfortunately the rest called off) — full of music, Neil’s activism, and so many Zumans and Nei fans meeting around the world, some of them for the first time in their life. Thank you all for this. Have a peaceful outcome of this year and a colorful outlook for next year, 2014.
we wish you all a great fest and thanks for being here. Also may thanks to the BNB team that makes all this possible. Have a peaceful outcome of this year and a colorful outlook for next year, 2013. Neil Young and Crazy Horse will tour in Australia New Zealand, Europe, and some of us will meet, and the climax will be the meeting of the list in America at the Great Forbidden Lake. by -- N Young, Rolling Stone Interview, 4 Sept 2003.